Stump Grinding | DFW Tree Services | Dallas TX – Low Fee! Some tree stumps are so large or there are so many of them it makes more sense to grind them out. Sure, you could rent a tree grinder yourself, but these machines are heavy, unruly, and can be dangerous for the inexperienced. You could buy one, but where would you store it after the tree stumps are gone? And who is going to get rid of all the ground up wood? DFW Tree Service will save you time and money with our stump grinders! We have grinders small and large, all equipped with sharp teeth to chip away at the stump until it is gone. When finished, we either haul away the ground up tree trunk, or bury them so they are no longer an eyesore. We charge by the stump, not by the hour or the diameter. We will come over, take a look at the tree stump or stumps. We will set the price for the first one and offer a substantial discount on the second or third. Tree stump grinding appointments usually take just one day of work. Once we’re done, we will either bury the wood chips or completely remove the debris from your yard, depending on your needs. You’ll never know there was once a stump! 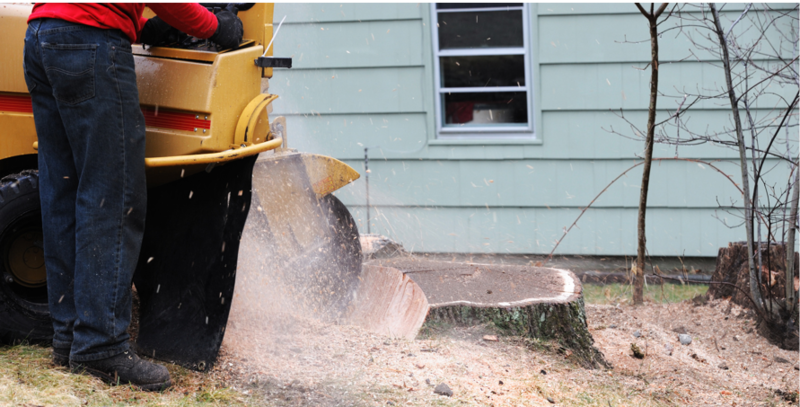 Stump removal can be time consuming and costly, but not with us! We will beat any written estimate by 10%, guaranteed. DFW Tree Service promises reliable, professional, friendly service. All of our workers are trained to our stump grinders and wear safety equipment at all times, as required by OSHA. If you’d like to discuss stump grinding or any other tree service, please call (469) 706-9832. Serving the Greater Dallas/Ft. Worth area!